Do you know of any Pools in Spain that should be listed here? Contact us!. Going to a Cesar Pool is increasing especially within the elderly population sectors of Cesar, who have suffered some style of muscle or bone damage. Please have a look at the pools swimmers like you have got reported near Cesar. 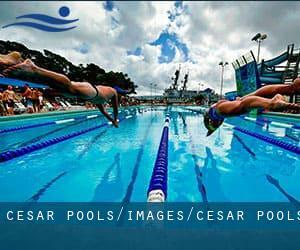 Please, report any Cesar Pool not listed here. 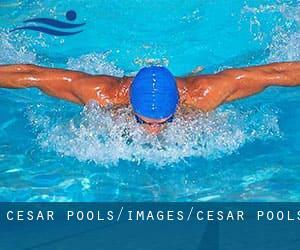 Please get in touch with the sports center in Cesar to check which activities are being offered and their timetables, since Cesar Pools may have diverse rules and fares than other locations. Most of the Cesar Pools provide both open lanes for independent swimming and also guided activities like water aerobics or Aquabike. Are you on holiday and want to maintain fit and wholesome? Swimia.com offers you the easy and quickest technique to obtain Aquagym in Cesar near your current location. Enjoy the best indoor pools in Cesar and don't worry about the weather. These facilities are open all seasons and you can enjoy a swim at the same temperature every day of the year. There are quite a few reasons why you should choose a heated swimming pool in Cesar. The most essential one relies on the importance of keeping the body temperature stable. If the water is too cold, your body will try to warm it up and you will lose strength to swim properly. One with the advantages of outdoor swimming in Cesar is the possibility to sunbathe throughout the summer season. Taking it with extra care, sunbathing is wholesome since introduces Vitamin D into the body, so the best option seems to be switching in between indoor and outdoor pools depending on the season. Holding an estimated population of 73.360, Aguachica is one of the most important cities in Cesar. Check all of the Swimming Pool in Aguachica and its surrounding area. Swimming is really a great concept to help keep your body active during your visit to Valledupar (Cesar), or even when you are a local. Swimia helps you to find your closest Pool in Valledupar. Without a shadow of a doubt, swimming in Agustín Codazzi could be the best technique to unwind after function. Take a couple of minutes to browse Swimia's catalog to find a Swimming Pool in Agustín Codazzi. Whereas Ariguaní is one of the six most populous cities in Cesar with nearly 26.246 residents, you shouldn't miss that one if you're going to Cesar. Updated on 2019 Behind the Coliseo Humberto Perea , Barranquilla , COLOMBIA. Swimmers like you have reported Olympic size x 25 meters, 8 lanes, Outdoors. Also, you will find ~20 meters x ~20 meters diving pool, Outdoors. Just in case you want to contact this Swimming Pool before dropping by, we only know the phone number. Centro Urbano de Recreación CUR , Carrera 61 No. 49 B 23 , Bogota , COLOMBIA. Swimmers like you have reported Olympic size, 8 lanes, Indoors. Also, you will find 25 meters, Indoors. Just in case you want to contact this Swimming Pool prior to dropping by, we only know the phone number. Autopista Norte Calle 195 , Bogota , COLOMBIA. This sports center offers 25 meters, 6 lanes, Outdoors. For this Swimming Pool, only phone number is number here. Variante Las Palmas , Medellin , COLOMBIA. Among all the activities offered by the center, should you be interested in swimming you'll get pleasure from 25 meters, Outdoors. If you might want to make contact with this Swimming Pool, email address and phone number are both number. Villa Olìmpica Duitama , Duitama , COLOMBIA (Postal Code: 098). This sports center offers Olympic size, 10 lanes, Indoors. For this Swimming Pool, only phone number is number here. Calle 200 , Bogota , COLOMBIA. This sports center offers 25 meters, 6 lanes, Indoors. For this Swimming Pool, only phone number is number here.